Explanation: Filled (black) circles correspond to methylated Cs, unfilled (white) circles correspond to unmethylated Cs, and small vertical lines without a circle correspond to non-CpG position where there is a CpG in the genomic sequence. This image is scaled to the size of the web browser window. To zoom in please increase the window size or open the picture into an image viewer. To change the image resolution and other properties of BiQ Analyzer's diagrams please modify the program's 'default.cfg' file. Explanation: Each box corresponds to one CpG position in the genomic sequence. 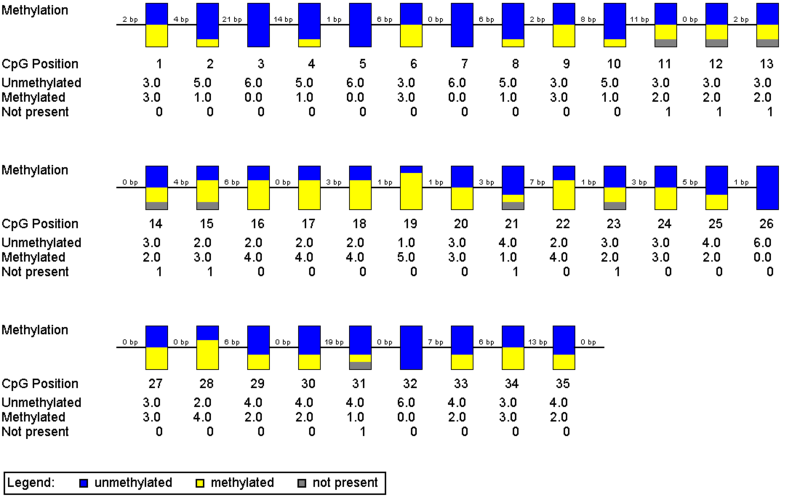 The colored bars summarize the methylation states of all sequences at that position.